The legendary Sachin Tendulkar got a memorable gift in his emotionally-charged farewell Test which lasted just about two and a half days as India crushed a hapless West Indies by an innings and 126 runs to complete a 2-0 whitewash in one of the most lopsided contests in recent history. There was an outpouring of emotions when the moment arrived as a teary-eyed Tendulkar left the playing arena, which he dominated for 24 long years. 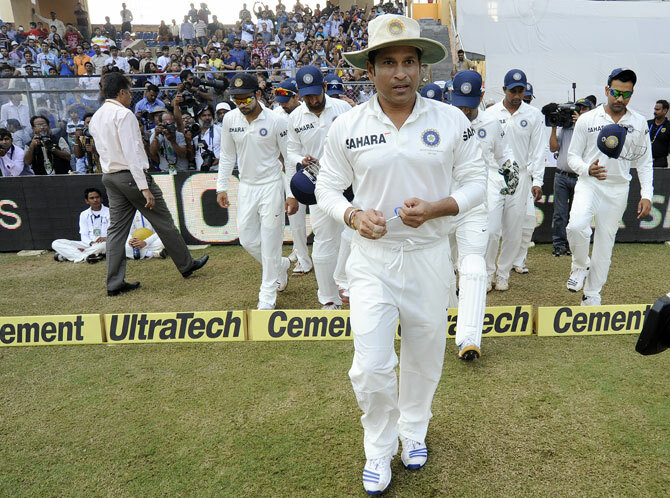 Amid standing ovations from his teammates as well as the fans who had thronged the stadium to see the champion for one last time, Tendulkar walked into the sunset of his glittering career. Starting the day at 43 for three, the West Indies were skittled out for a paltry 187 in their second innings as Pragyan Ojha completed a match-haul of 10 wickets taking his second five-for. The legend led the team out to the field in the morning session. Gauging the emotional atmosphere, skipper Mahendra Singh Dhoni, once the play was extended for 15 minutes after the fall of eighth wicket, introduced Tendulkar to roll his arms for a couple of overs amid deafening cheers from the partisan crowd. He pitched a googly right, bowled a few loopy half volleys which were cheered by one and all. 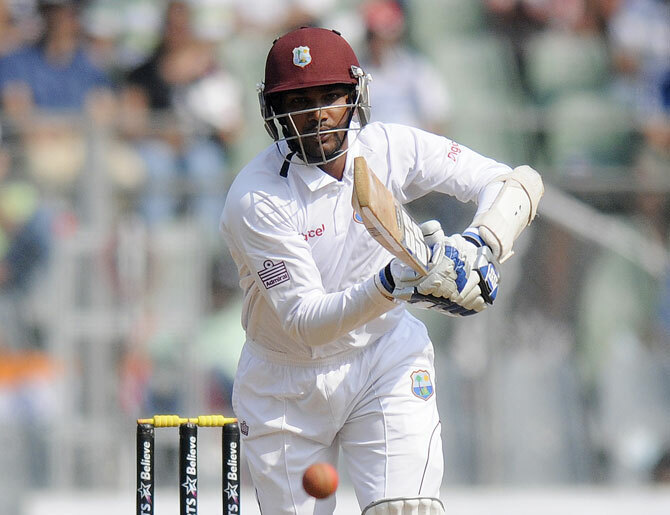 Shivnarine Chanderpaul, playing his 150th Test match offered some resistance in company of Denesh Ramdin (53) as they added 68 runs for the seventh wicket before the veteran padded up one from Ashwin that went straight after pitching. Chanderpaul scored 41 with four boundaries. Ramdin, however, continued hitting the odd boundaries in between as he reached half-century as wickets fell at the other end. It was Mohammed Shami, who brought an end with a typical inswinging delivery that brought curtains down on a wonderful career. 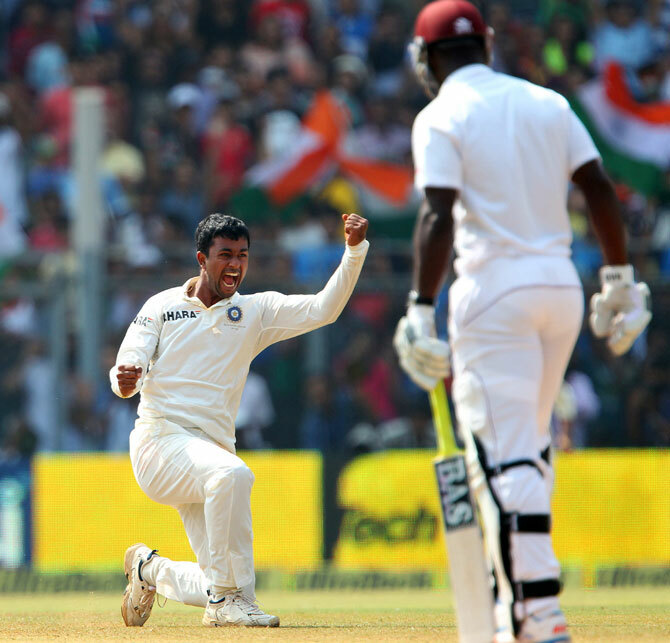 Pragyan Ojha completed a match-haul of 10 wickets taking his second five-for. The left-armer became the only second spinner - after Laxman Sivaramakrishnan - to take 10 wickets or more in a Test at the Wankhede. He was named the man-of-the-match for his efforts. Only seven sessions of play was possible in a Test match in which one of the most respected and celebrated cricketers in the history bid goodbye to the game in front of his home crowd and his family, many of whom watched him for the first time from the stands.